Born Natsume Kinnosuke (夏目 金之助), he is widely considered to be the foremost Japanese novelist of the Meiji period (1868–1912). He is best known for his novels Kokoro, Botchan, I Am a Cat and his unfinished work Light and Darkness. He was also a scholar of British literature and composer of haiku, Chinese-style poetry, and fairy tales. From 1984 until 2004, his portrait appeared on the front of the Japanese 1000 yen note.
. WKD : yakubarai 厄払 Casting off the Old Impurities and Sins . 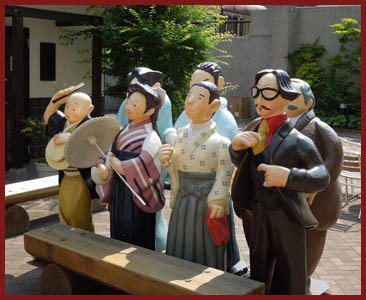 The famous novel "Botchan" by Natsume Soseki takes place in Matsuyama, where he lived with Masaoka Shiki for a while. "A long day, we pass yawns and depart."
. Soseki and Masaoka Shiki . When Natsume Soseki came to visit Masaoka Shiki in Matsuyma in 1892, Shiki's mother Yae prepared the dish for them. Kyoshi, who happened to be there too, wrote about this meeting, describing Soseki sitting in his western suit on the cushion, trying to eat carefully so as not to soil his suit and the floor and finishing every little grain of rice.
. Matsuyama sushi 松山すし and poetry .
. Two friends, two haiku - Honkadori　本歌取り . for Natsume Soseki staying in Matsuyama, when Masaoka Shiki left for Tokyo.
. Fireflies and the river Seta .
. WKD : Waterfall . The "original face" points to "the nonduality of subject and object"
. The Original face .
. Kasuri 伊予絣 Ikat from Iyo . yet no leaves to drop.
. kogarashi　木枯らし, 木枯, 凩 withering wind .
. Kusamakura 草枕 - Matsuo Basho und Soseki .
. Reference 夏目漱石　俳句 . The mystery remains on how the long-established Hiiragiya inn in Kyoto obtained a portrait of literary master Natsume Soseki created by manga artist Ippei Okamoto (1886-1948). But the artwork is viewed as an invaluable piece for studying the connection between Soseki (1867-1916) and Japan’s ancient capital. 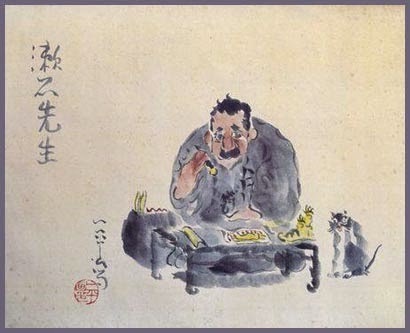 The drawing, titled “Master Soseki,” appears to be an original piece in a collection created and distributed at the beginning of the Showa Era (1926-1989) by Tokyo Manga Kai and its successor, Nihon Manga Kai, according to Yoshiteru Nakayama, a 76-year-old former curator of the Kyoto Prefectural Library and Archives. Okamoto apparently drew several of the same portraits of Soseki. 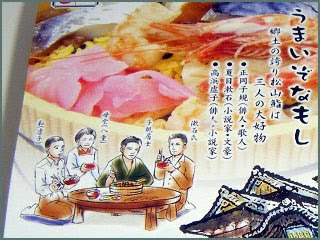 A drawing of identical composition to the one at Hiiragiya is kept at the Tohoku University Library. "Hearing in London the News of Shiki's Death"